Normally, in my household, when someone says the words “too hot,” the other replies, “Hot damn!” so I would appreciate it if you would do that before proceeding with reading this post. Edmonton is weird because we have such a short, changeable spring followed by a short, hot, sunny summer. I’ve found that often the greens I plant in early spring are sprouting and then going straight to seed. When a plant goes to seed (or bolts), it suddenly grows a lot in a short time and starts focusing its energy on making flowers or seeds instead of making leaves. For greens, this is usually bad because the leaves’ tastiness often decreases (leaves may get wilty, or taste bitter, or get tough). 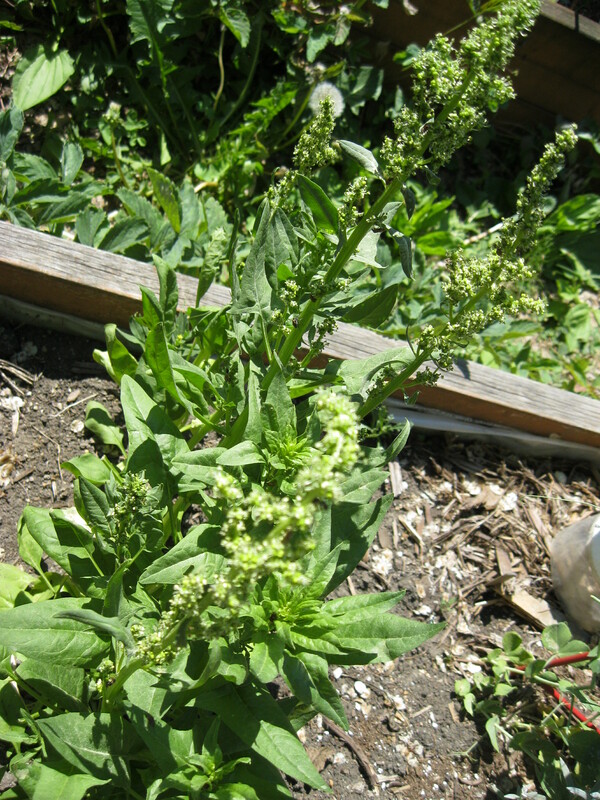 << Spinach, gone straight to seed like a sissy. In Edmonton, I think part of the problem is psychological. We have such long, cold winters, it’s hard to believe that it could ever be too hot for a plant. But the tragedy of bolting is real, you guys. It’s too hot. (Hot damn.) And because our growing season is so short, we can’t plant a “second crop of fall greens,” as UK and US gardening books are always charmingly suggesting. It’ll be way too hot in August when the seeds are sprouting, and then they’ll go straight to seed; plant ’em a little later, and they’re at the mercy of early September frosts and shorter days. 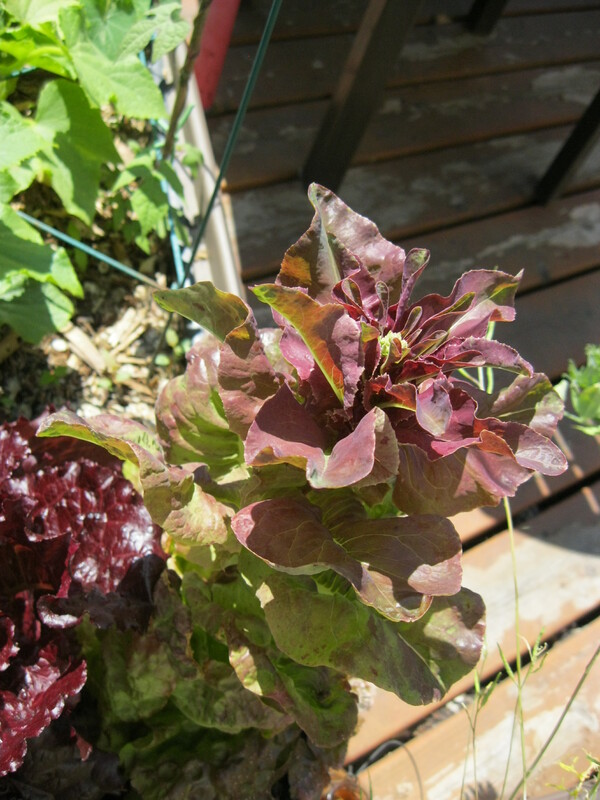 >> The prettiest lettuce to ever grow itself into a fortified lettuce-tower in a misguided attempt to prevent me from eating it. Plant these as soon as you can get things in the ground in the spring and eat them as they come up – they won’t last long. Look for varieties that are “heat tolerant” or “slow to bolt.” You might find lettuce or spinach varieties that will last longer than average. Malabar/New Zealand Spinach – I’ve grown both of these before, and I wasn’t crazy about the texture, which is kind of succulent and juicy. Both of them are kind of cool-looking viney plants that thrive in hot weather, so if that appeals to you, give them a try! Purslane – I’ve never tried this one. *These two greens will technically bolt (mine have already), but they still taste OK. I keep eating ’em all summer. 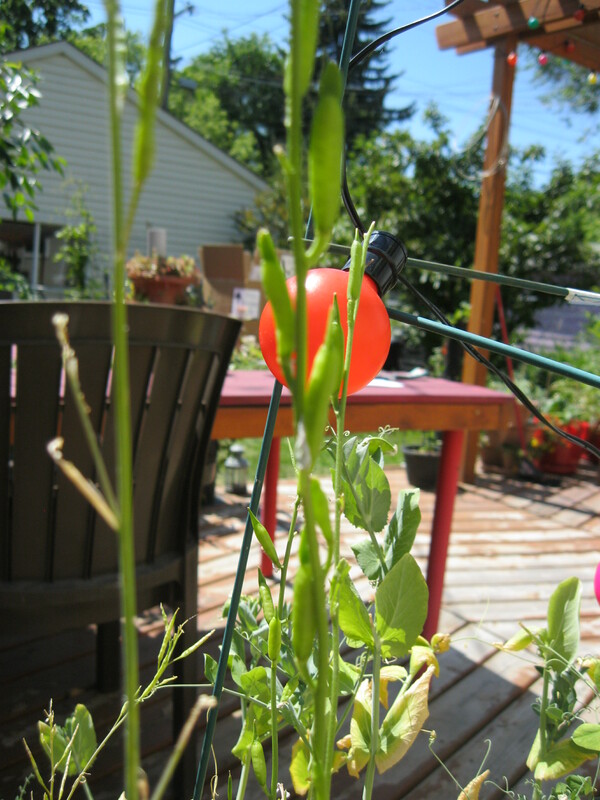 << Arugula, growing its little seed pods already like an idiot. Stupid plants, planning for the future instead of letting me eat them! If anyone has any other recommendations for hot summer greens, please leave ’em in the comments, I’d be happy to hear them!